What is the case for rebuilding the Jewish Temple? Does the Bible predict such an event? If so, where and how it might be built? What does the New Testament say on the subject? What are the implications for Christians should the Jewish Temple be rebuilt? However eccentric or strange it may seem, influential Christian leaders are actively promoting and funding Jewish religious groups who want to destroy the Dome of the Rock in Jerusalem, situated next to the Al Aqsa Mosque, the third most holy shrine within Islam. They want to replace it with a fully functioning Jewish Temple. They are doing so because they believe the Bible mandates it. Indeed, some Christians like pastor Clyde Lott, a Pentecostal rancher from Mississippi, are even trying to breed the perfect red heifer to assist in future Temple sacrifices. According to the Book of Numbers chapter 19, the ashes of a red heifer are needed to purify the priests and altar before sacrifices can be offered again. The search for the red heifer has been described as a ‘four legged time bomb’. Other’s like John Hagee and Christians United for Israel are so upset by the presence of the Islamic Dome of the Rock dominating the view of Jerusalem, they have simply airbrushed it out of the picture. Check out the logo on the website of Christians United for Israel. Its made up of a photograph of the Wailing Wall. There’s a garden on top but no Dome of the Rock. No Al Aqsa. They have vanished. The thousand words painted by this picture is an essay on fundamentalist Christian Zionist fantasies… A fantasy world in which there are no Palestinians… Even more frightening is the possibility that those who live with this illusion will take steps to make the fantasy come true – to destroy the two mosques which are absent in the CUFI photo. What makes their plans even more bizarre is that they believe the Temple must be rebuilt just so that it can be desecrated one more time by the Antichrist before Jesus returns. They believe Daniel and Matthew predict the Temple will be desecrated before Jesus returns to rescue Israel and defeat her enemies in the ‘Battle for Jerusalem’. Unfortunately, this is not just some wacky belief held by a small group of fanatics. In 1989, Time magazine reported the findings of a survey showing that some 18% of Israelis thought it was time to rebuild the Temple. By 1996, when the Temple Mount Faithful sponsored a Gallup poll seeking a referendum on replacing the Al-Aqsa Mosque with a Jewish Temple, support for the action had risen to 58%. When you realise that Arab Israeli’s, who are mostly Muslim, would certainly not back the idea, the percentage of Jewish Israeli’s who do so, must be even higher. What makes this poll even more significant is that while Israeli society is divided on just about every other subject, according the Gallup, this was the largest show of support any Israeli organisation has ever received on any issue. Six months later, in July 2001 the Rabbinical Council of Judea, Samaria and Gaza called on all rabbis to bring their communities to visit the Temple Mount. This was the first time a group of rabbis representing a significant proportion of the religious Jewish community had ruled it permissible for Jews to ascend the Temple Mount. Previously this had been forbidden. The rabbis also called upon the Yesha Council of Jewish settlements to organise mass visits to the Temple Mount from the settlements. So what on earth would lead so many Jews and Christians to agree on such a provocative and dangerous plan that could very well start World War 3? As scary as it may seem, they simply believe the Bible not only predicts but indeed requires them to help rebuild the Jewish Temple, with no fear of the consequences. Let’s consider their arguments. Though some rabbis might minimize the revealed system of worship and its requirements, can the individual Jew neglect what God says? Can there be a “proper” Judaism without a priesthood, an altar, a sacrifice and a place on earth where God meets the individual? The answer to Glaser is obviously ‘no’. This is also the reason why some Christian Zionist organisations celebrate the Feast of Tabernacles in Jerusalem each year. They are anticipating the day when, according to their literal reading of Zechariah 14, they believe everyone, including you and me, will go to Jerusalem annually to worship God. The reference to sacrifices is not to be taken literally, in view of the putting away of such offerings, but is rather to be regarded as a presentation of the worship of redeemed Israel, in her own land and in the millennial Temple, using the terms with which the Jews were familiar in Ezekiel’s day. Scofield was the great exponent of literalism. If we are to take the Bible literally, then the sacrifice of a ‘young bullock’ cannot be mistaken for a ‘memorial offering’ which consisted of grain and oil. The story of Cain and Abel reminds us of the hazards of offering God the wrong kind of sacrifice! (Genesis 4:4-7). If this particular reference to sacrifice in Ezekiel 43 need not be taken literally, then what is all the fuss about? Why is it necessary to take other Old Testament prophecies ‘literally’ and apply them to Israel today if not this one? Sounds a little inconsistent doesn’t it? They want to have their cake and eat it – or in this case, they want their sacrifices without the blood. Obviously the Temple has been rebuilt because Daniel tells us this ruler puts an end to sacrifice and sets up some kind of abomination (a loathsome horror that would be anathema to Jewish worship) right inside the Temple in Jerusalem. Ultimately this ruler is destroyed in a final conflagration of enormous proportion. Now you may need to make a strong coffee at this point and read the passage a few more times to understand the logic. Put simply, the question is – How can Daniel refer to sacrifices coming to an end in verse 27 when the Temple has apparently already been destroyed in verse 26? Simple – Daniel must be talking about two different Temples! So verse 26 must be describing what happened in 70 AD when the Romans destroyed Herod’s Temple and verse 27 must refer to a future Temple. To justify this interpretation, however, they must place a 2000 year gap or ‘parenthesis’ between verses 26 and 27 and argue that the prophetic clock stopped during what they call ‘Church Age’ or the ‘Times of the Gentiles’ (Luke 21:24). The fact that Hezekiah’s Temple was desecrated by Antiochus Epiphanes in 168 BC and then Herod’s Temple between 67-70 AD, first by Jewish Zealots then again by Titus and his Roman army during the Jewish Revolt, doesn’t apparently count. It has got to happen all over again. The argument falls to the ground, however, if you don’t believe Daniel’s vision is describing two separate events separated by thousands of years. The other favourite passage of Temple watchers is Matthew 24:1-2, 15-16. To be consistent with their interpretation of Daniel, those advocating the need for another Jewish Temple must again add a 2000 year chasm between Jesus words in verses 1-2 and verses 15-16. Frankly, I’d much rather accept the eyewitness account of the 1st Century Jewish historian, Flavious Josephus, who describes how Daniel’s prophecy came true before his very eyes between 67-70 AD. There is actually nothing in the text of Daniel, Matthew, or any where else in the Bible, that suggests or requires a 2000 year gap between the verses of these two passages. To put it kindly, Lindsey and his colleagues are “pulling a fast one” over the text of Scripture. Why? Your guess is as good as mine although this kind of tabloid journalism linking the Bible with contemporary events is certainly the way to sell books, at least first editions. Hal Lindsey claims his book, The Late Great Planet Earth at 15 million copies in over 30 languages has ‘sold more copies than any Christian book in history other than the Bible.’ Thankfully the Bible is easier to read and still more popular. If the Biblical case for rebuilding the Temple is rather suspect, the quest for locating its original foundations reads more like something out of an Indiana Jones script. Even though many Jews and Christians believe the Temple must be rebuilt, there is one small problem. It is essential that any future Temple is built on the same foundations as the previous ones. And on this rather fundamental point experts cannot agree. Where was the Holy of Holies located? The simple answer is ‘we don’t know’. While it may not particularly matter to any budding antichrists, it does matter to the ultra-orthodox Jews. When Jesus predicted the Romans would not leave one stone left on another and that ‘every one will be thrown down.’ (Matthew 24:2), he was right. The Romans fulfilled Jesus’ prediction to the letter when they burned to the ground and then flattened Herod’s Temple along with the rest of Jerusalem. Two thousand years later, the quest to find the site of the Temple is causing a good deal of heated debate within Israeli archaeological circles. There are four contenders each with their scholarly advocates and scientific theories. Unfortunately, the Dome of the Rock is situated over the most popular site. Inside the third most holy shrine to over one billion Muslims is a rocky outcrop on which Jews believe Abraham offered Isaac. Beneath it is a very ancient cave with a hole in the roof that looks remarkably like the place where the blood from the Temple sacrifices might have been collected and flushed away. It is now a place of prayer for Muslims. On the last point at least, Lindsey is right. Building a Temple with all the fancy architectural detail stipulated by Ezekiel is going to be pretty expensive. So who is going to foot the bill? You guessed it – gullible Christians who believe they are helping speed the return of Jesus. I was in Colorado Springs recently when Gershon Salomon was also speaking – in his case at one of the largest churches in town, raising funds for his organisation. Grace Halsell estimates that at least $100 million a year is being raised by some rather well-known televangelists and church leaders to rebuild the Temple. And if you want to know where to send your own donation, Randall Price in his book, The Coming Last Days Temple, provides you with the contact details of all the Jewish organisations committed to rebuilding the Jewish Temple. Charles Colson in his book Kingdoms in Conflict describes in the foreword a very realistic scenario in which an American President (probably modelled on Ronald Reagan) is faced with the hardest decision of his life. Jewish terrorists have blown up the Dome of the Rock and are being filmed live on Christian TV channels. Raised a Christian Zionist he believes the Bible predicts the rebuilding of the Temple, but his military advisors urge him to send in the US Marines to intervene, occupy the Temple Mount and maintain the status quo. What is he to do? Colson leaves you with the dilemma unresolved but with the clock ticking. Although a fictional scenario, he assures us in a footnote that the US military have anticipated such an event and have plans in place if and when it happens. That may or may not fill you with much confidence. In fact, this is not just fictional speculation. While some Zionists are praying like crazy for an earthquake to do it for them, others like Gershon Salomon and his Temple Mount Faithful are unwilling to wait for divine intervention. In July 2001, the Israeli Supreme Court made a significant decision. For the first time ever they allowed the Temple Mount Faithful to hold a symbolic cornerstone laying ceremony for the Third Temple near the Dung Gate adjacent to the Western Wall. Every year since then attempts have been made to carry their three ton corner stone onto the Temple Mount on Tisha B’Av (29th July). That is the day when the Jews mourn the destruction of the first and second Temples. In 2006, despite police objections, the Israeli Supreme Court gave permission for members of the Temple Mount Faithful to actually enter the area of the Haram Al Sharif on the festival of Tisha B’Av. An Israeli Arab MP, Mohammed Barakeh described the High Court’s decision as ‘petrol in the hands of declared pyromaniacs’ To pre-empt a massacre, the police closed the site to Jews as well as Muslims for the whole day based on intelligence reports that thousands of Muslims were planning to flock to the site to protect it. The Israeli Government must do it. We must have a war. There will be many nations against us but God will be our general. I am sure this is a test, that God is expecting us to move the Dome with no fear from other nations. The Messiah will not come by himself, we should bring him by fighting. Shades of Judas and the 1st Century Zealots who tried to force the hand of God to act. It is sobering to learn that since 1967 there have been no less than 100 armed assaults on the Haram Al Sharif often led by Jewish rabbis. That averages out to more than two a year. Sadly, the Israeli authorities, political and religious, have yet to condemn any of these attacks. Gordon Welty, an anthropologist, explains the apparent contradiction of evangelical Christians claiming to follow Jesus yet choosing to support Jewish terrorists. Their power is to keep inconsistencies in airtight compartments, so that they themselves never recognize these inconsistencies… If the money a muscular Christian donates to the Jewish terrorists buys the dynamite that destroys the mosque, the muscular Christian will say simply, “It was an act of God”. As Lawrence Wright has observed, ‘Jewish longing for the Temple, Christian hopes of the Rapture, and Muslim paranoia about the destruction of the mosques [are being] stirred to an apocalyptic boil.’ We wait with bated breath. The problem with all this speculation about a future Temple in Jerusalem is simply this – from a Christian perspective – it is heresy. There is absolutely nothing in the New Testament about the need for another Temple in Jerusalem – just the reverse – the old Temple was declared redundant the moment Jesus died on the cross. The curtain separating the people from the Holy of Holies was torn in two – significantly from top to bottom. That is why the writer to the Hebrews says: ‘By calling this covenant “new”, he has made the first one obsolete; and what is obsolete and ageing will soon disappear.’ (Hebrews 8:13). This is the theological explanation for the destruction of the Temple in 70AD. It had served its purpose. The true Temple had arrived. In a play on words, God then tells David he is not to build a house (Temple) for God but instead God will build a house (dynasty) for David. Just as God gave in to Israel’s desire for a king, so he tells David that he will allow his son Solomon to build him a house, although the impression given is that God preferred to dwell with his people in a tabernacle because it kept his people dependent on his leading. The true and lasting Temple is Jesus. The sanctuary in Jerusalem, however beautiful, was only ever a copy and shadow of the heavenly one (Hebrews 8:1-5). This is how Jesus introduces the idea in John 2. When Jesus entered the Temple and threw out the money changers he wasn’t ‘cleansing’ it for future use. He was declaring it redundant. He himself is the one and only true Temple. The temporary earthly replica was now close to its ‘sell by’ date. The real, more glorious and lasting Temple had arrived. That is why in his conversation with the Samaritan woman, Jesus said we could now worship God anywhere (John 4:21-24). The writer quotes from Psalm 40:6-8 to show that obedience is more important than sacrifice, and that the obedience of the Son of God in the offering of his body would supercede and annul the need for the perpetual offering of animal sacrifices. God used the Roman General Titus to destroy the Temple in the same way he had used the Babylonian King Cyrus to help build it. When Jesus cried out ‘It is finished’ as he died on the cross, he did indeed ‘make perfect those who draw near to worship… [and] take away sins’ (Hebrews 10:1,4). The Temple sacrifices, at best, only ever provided a temporary cover for sin. The daily sacrifices, and the smoke rising from the altar were a constant reminder of the need for a Saviour. How then could God encourage the sacrificial system to be reinstated when he had sent his son Jesus to be the ultimate sacrifice, to shed his own blood on the cross to take away our sin? To suggest sacrifices must be made once more undermines the New Testament’s teaching that the work of Christ is sufficient, final and complete. Those who advocate the need for a new Temple and reintroduction of sacrifices are ignoring the way the image of the Temple is invested with new meaning. Subsequent to Pentecost, the Temple imagery is applied to the Church, the Body of Christ, the dwelling place of the Holy Spirit. For example, Paul, writing to the Church in Ephesus, describes them as part of the new living Temple. In his letter to the Corinthians, Paul quotes from passages in Leviticus and Isaiah, both of which refer to the physical Tabernacle and Temple, and applies them to the Church. In his letter to the Romans, Paul uses Temple language to describe how we are to offer, not a dead animal sacrifice but our bodies as living sacrifices as our act of worship (Romans 12:1-2). Peter does the same thing describing the Church using Hebrew imagery associated with the Temple (Psalm 118:22; Isaiah 28:16). Christians are, he says, being made into the new house for God, in which Jesus is the ‘precious cornerstone’ (1 Peter 2:5-7). 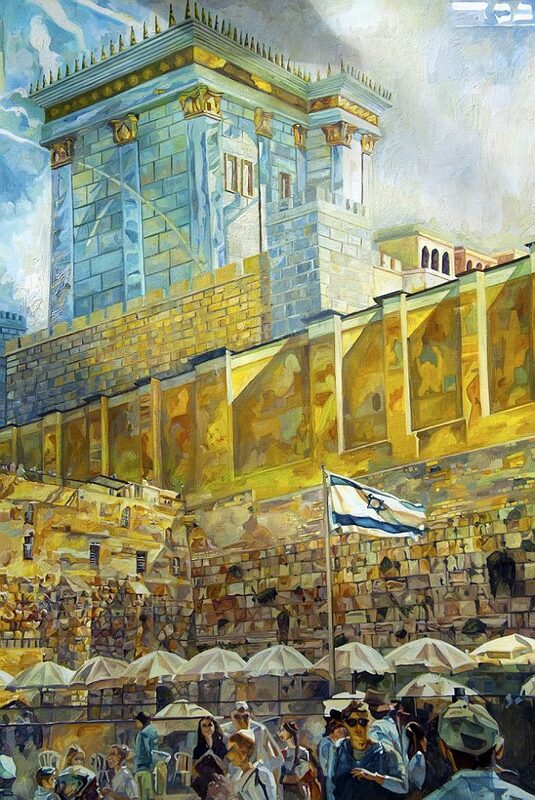 So the Temple in Jerusalem was only intended to be a temporary building, a shadow pointing to the day when God would dwell with people of all nations through Jesus Christ. It is impossible for those who have once been enlightened, who have tasted the heavenly gift, who have shared in the Holy Spirit, who have tasted the goodness of the word of God and the powers of the coming age, if they fall away, to be brought back to repentance, because to their loss they are crucifying the Son of God all over again and subjecting him to public disgrace. (Hebrews 6:4-6). And that is the final rub. People must choose between a religion and a relationship; between the words ‘do’ and ‘done’; between law and grace; between the need to offer continual sacrifices for sin or accept the finished work of Jesus Christ in our place; between a physical Temple and a spiritual one; between one in Jerusalem that is redundant and one that encompasses the whole world that is under construction. In this chapter we have considered the case for rebuilding the Jewish Temple. We’ve examined some of the biblical passages used to justify the construction of yet another Temple in Jerusalem. We have seen that there is in fact not a single verse in the entire New Testament which predicts that a Jewish Temple will ever be rebuilt or that a 2000 year ‘parenthesis’ should be placed between references to its desecration and destruction in Daniel, or that a future Temple in Jerusalem will play any part in God’s future purposes. We have seen how the followers of Jesus Christ are described as a living Temple, indwelt by the Holy Spirit. How tragic that, while the good news of Jesus is intended to bring peace and reconciliation with God and healing between nations, some Christians are fuelling religious hatred, and are bent on inciting an apocalyptic war. Attempts by militant Jewish groups to destroy the Dome of the Rock and rebuild the Jewish Temple have widespread support and are taken very seriously by the Israeli authorities. Any attempt to rebuild the Temple will very likely ignite an apocalyptic war with Muslims worldwide. For some, the case for rebuilding the Temple is based on the mistaken belief that only through the reintroduction of the sacrificial system can Jewish people atone for their sins. For others, the Temple must be rebuilt so that it can be desecrated one more time before Jesus returns. This is only possible by the insertion of a 2000 year gap between Daniel 9:26 and 9:27 and Matthew 24:1-2 and 15-16. This assumption must ignore the way in which previous Temples were desecrated by Antiochus Epiphanes, the Jewish Zealots as well as by Titus and the Roman army. There are four different theories as to where Herod’s Temple was located and therefore there is no consensus as to where any new Jewish Temple should be built. There is not a single verse in the New Testament that requires or justifies a Temple in Jerusalem. The Temple was made redundant and obsolete when Jesus died on the cross. The Church, the Body of Christ, a living Temple. OT references to the Temple are applied to the Church. To advocate the rebuilding of the Temple is heresy. 2 Samuel 7:1-17; John 4:21-24; Hebrews 9-10; Ephesians 2:19-21; 1 Corinthians 6:19; 2 Corinthians 6:16; 1 Peter 2:9; Revelation 21:9-27. What role did the Temple fulfil under the Old Covenant? Why is an earthly Temple no longer required? What or who is the Temple? Where are we to worship God? How would a future Temple in Jerusalem undermine the finished work of Christ? John Hagee, The Battle for Jerusalem (Nashville, Thomas Nelson, 2001). Richard N. Ostling, “Time for a New Temple?” Time, (16 October, 1989), p. 64. Randall Price, The Coming Last Days Temple (Eugene, Oregon: Harvest House, 1999), p. 26. 1  Gershon Salomon, The Voice of the Temple Mount Faithful, 5761/2001, pp. 15-17. 2  N. Shragai, ‘Rabbis call for mass visits to Temple Mount’, Ha’aretz, 19 July 2001. Hal Lindsey, The Late Great Planet Earth (London, Lakeland, 1970), pp. 56-58. 1  C.I. Scofield, Scofield Reference Bible (New York: Oxford University Press, 1945), p. 890. E. Schuyler English (ed.) The New Scofield Study Bible (New York: Oxford University Press, 1984), p. 864. 1 Brickner, Future, p. 18. Hal Lindsey, The Apocalypse Code ( Palos Verdes, California, Western Front, 1997), p. 78. See Flavius Josephus, Jewish Antiquities, in The New Complete Works of Josephus (Grand Rapids, Kregal, 1999). 1 Hal Lindsey, Planet Earth 2000, (Palos Verde, California, Western Front, 1994), pp. 156, 163. Grace Halsell, Forcing God’s Hand (Washington, Crossroads International, 1999), pp. 68-69. Randall Price, The Coming Last Day’s Temple (Eugene, OR, Harvest House, 2002). Charles Colson, Kingdoms in Conflict (London, Hodder, 1988), preface. Sam Kiley, ‘The righteous will survive and the rest will perish’ The Times, 13 December 1999, p. 39. Halsell, Forcing God’s Hand, p. 71. Cited in Grace Halsell, Prophecy and Politics: The Secret Alliance Between Israel and the U.S. Christian Right (Chicago: Lawrence Hill Books, 1986), pp. 115.